When working with clients I have noticed that people often believe change is possible and they believe EFT is the tool that will help them to make that change…but they don’t believe it is possible for them. They tell me stories of how they have made too many bad choices, their family history runs too deep, or their habits are just too ingrained. When a part of us doesn’t believe it is possible for us to change, it’s very difficult to transform because we don’t want to waste effort. And when this happens it is obvious that nothing will change. Here is a tap-along audio for when it feels like you are too far gone and that transformation just can’t happen for you. Download it. Listen to it again and again. Each time you tap through it you are creating a little more room for hope. Hope is key to taking action. I have just discovered your site and want to express my deep appreciation for your work and insights. The one thing I would add to this podcast is safety in making changes. My sense for myself that I have built routines because a part of me has never felt safe. I have a habit of beating myself up and giving up on change figuring it is too late.Now I have hope that I can change my thinking and find peace. The whole concept of EFT is to change beliefs and automatically change behavior by letting go of restricting beliefs without putting ANY effort! 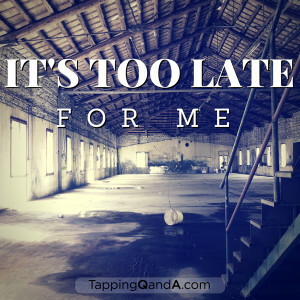 I am stuck in a rut for past 7 years..made poor choices all my life and now too late for me to fix a lot of things including having a family of my own, or is it? am I not supposed to accept what the universe gave me..love myself..and remove limiting beliefs and be open to accept from the universe good things without limiting beliefs and without any effort or control.